Mas village is one of the tourist attractions in Bali which is very well-known for sculpture craftsmen, its always an alternative stopover when tourists take a tour to Ubud or Kintamani. 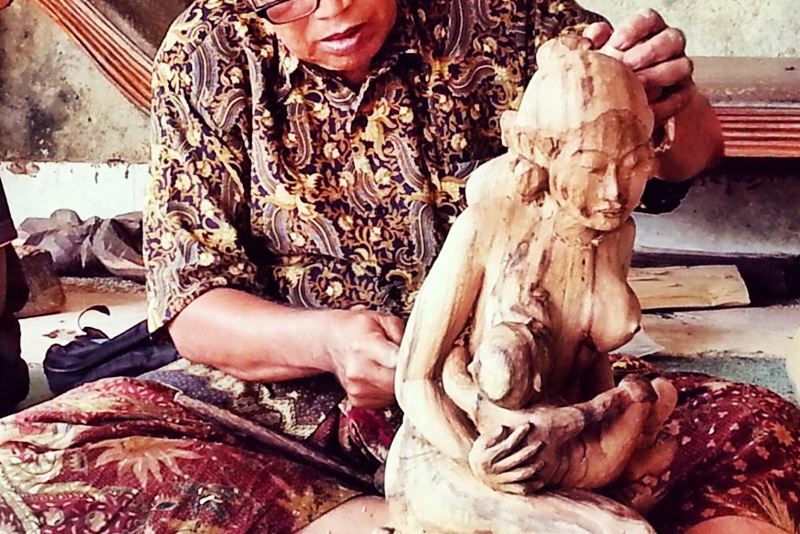 The expertise of the local people in inheriting their ancestral culture, which works as a sculptor, makes it increasingly famous along with the development of tourism on the island of Bali Paradise. Because of its artistic results such as amazing wooden sculpture, it is enough to boost the economy of the local community. 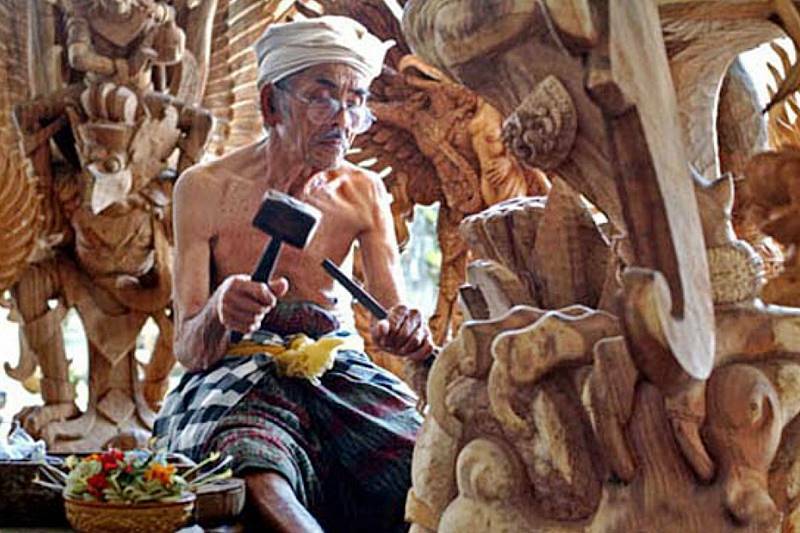 The fame of this village is inseparable from the great names of several maestros of sculpture who were born, raised and have talent in working wooden sculpture carving began his career in the village of Mas. If you travel to this village, its characteristics have already been seen, entering this area has felt that this village has become the center of wood carving, along the way lined with art shops displaying local residents’ artworks. Even though you don’t have a plan to visit here, if you are interested, you can stop by for a moment just to look around, and who knows if you find something unique and interesting for you, then you can have it. The location is very strategic with tourist route, Ubud District, Gianyar regency, Bali. Located about – 20 km from the direction of Denpasar city. If the tour is taken from the direction of the airport, you can stop by the Batubulan tourist attraction first with its daily Barong dance show and stop at Celuk village with its silversmith. You can join tour packages that have been prepared or use our Bali car rental services in Bali along with experienced and friendly drivers. Once we entering the Mas Village road, a row of art shops, displayed various wooden sculpture crafts. The stretching of this handicraft business serves to reduce unemployment, to accommodate workers as sculptors, carvers and odd jobs can be a permanent or sideline livelihood. A distinctive feature of carving wood sculpture that emphasizes the synergy of the characteristics of humanism and naturalism. You can just stop by, don’t have to shop, but if you are interested in Balinese souvenirs, the owner of the shop will very happy to share about the material woods and tell you about the process how to complete a piece of fine artworks. Witness the carver, starting from selecting materials, making procedures and finally producing finished goods that are ready to be marketed. This is a complements of your travel experience during holidays in Bali accompanied by our informative Bali Cab team drivers. The fame of this village as an art village is reasonable, the results of the Mas village wooden sculpture are very diverse as statues for offerings such as statues where the process through upakara or ceremony can be interpreted as a symbol of sacred objects that have magical powers, and are often used as symbol of manifestation of our God. Sculptures that reflect the social life of Balinese people everyday are also abstract dimensions as a manifestation of the imagination of artists who are responsive to the nature, dynamics and philosophy of life, often used by local people and favored by foreigners. It is not uncommon for the Mas village sculpture to reach the international world, exported to another countries. Every day visited by foreign and domestic tourists to see and buy the results of the Mas Village community handicraft industry, its strategic location on the main route of the Kuta – Ubud – Kintamani tourist route is quite advantageous as a stopover. Residents who pursue carving in Mas village like a tradition, continue to flow the generation of their successors. The village handicrafts are also popular with local Balinese residents. Bali will not end if you want to talk about it, not enough just a day, a week or even a month to find out about traditions, culture, art and beautiful natural scenery, but before you determine the desired tour program, get information on tourism objects in Bali from our Bali Cab Driver officer, to make it easy to arrange your tour agenda with our smiling Bali drivers. On your way to Mas village, you may stop at Tegenungan Waterfall, see the natural beauty of green panorama, will spoil your eyes, or after Mas village you can visit Elephant cave Temple and spend the day at Ubud Center to have some lunch or having coffee the best coffee around the Central of Ubud.